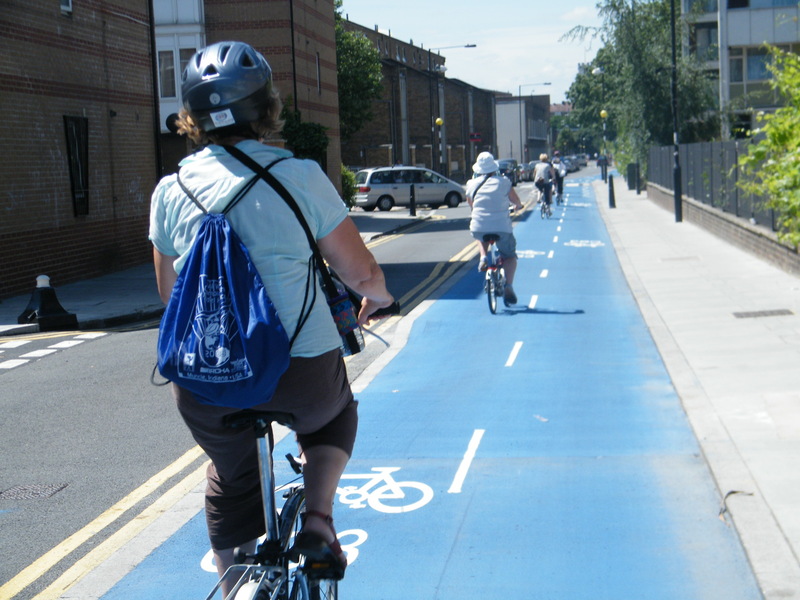 Remember the Times of London’s “Cities Fit for Cycling” campaign? Earlier this year one of the most prominent dailies in the UK pulled out all the stops to make bicycling safer in British cities, promoting a comprehensive policy platform. The campaign is for real: The Times is now getting London mayoral candidates on the record with their bike policy positions. Here’s how this political slugfest is playing out. Tory Boris Johnson, the mayor who launched the largest bike-share system in the English-speaking world (so far) and built the first corridors in a network of “cycle superhighways,” hasn’t done enough to make cycling accessible and safe, according to his chief rival, Labor candidate Ken Livingstone. Livingstone, who was ousted from the mayoralty by Johnson in 2008, made his reputation as a transportation reformer in his first stint as mayor. He instituted London’s congestion charge in 2003, completed a range of high-profile pedestrian reclamation projects, and initiated the idea of building high-volume bike routes. Now he’s attacking Johnson’s bike-share initiative for being out of reach to most Londoners, and assailing the cycle superhighways as little more than paint on the street. A political campaign group called “Londoners on Bikes” is going to deliver a bloc of at least 3,000 votes to the candidate who commits to the strongest platform for bicycling. Here are some highlights from Livingstone and Johnson, according to the Times. Safer junctions. Along with a comprehensive safety review of all major junctions, we will trial a cyclists-only green traffic light phase. Safer Cycle Superhighways. Redesign Cycle Superhighways with safe junctions, continuous routes, better segregation and proper maintenance. Mayor Johnson avoided dealing with the real challenges in favour of a quick headline and splash of blue paint on the road. Listen to cyclists about where secure parking is needed. Work with Network Rail and others to provide Dutch-style cycle parking hubs, and create a web-based tool for cyclists to tell transport planners where more facilities are needed. Review 500 key junctions across the capital to specifically examine safety for cyclists. This includes 150 major planned schemes as well as every junction on the Cycle Superhighways. Work with the London Criminal Justice Board to strengthen criminal justice procedures for dealing with cyclist deaths and serious injuries. Deliver safer infrastructure for cyclists, including building 12 Cycle Superhighways, which are trialing innovative new safety features such as trixi mirrors. Check out the Times coverage for the complete platforms from Livingstone, Johnson, and the Liberal Democrat and Green Party candidates. I wonder how our Mayoral campaign will compare. It was really Livingstone’s team that did the legwork for the bike share scheme when he was still Mayor. Boris just didn’t veto it. Wow. This is kind of incredible. Ben – how did London get to this point in political dialogue? It’s certainly a long way from Amsterdam and Copenhagen, but I am amazed to read and hear about such ambitious bike-related platform positions for the mayoral election. And a question to go with my question – how do we try and get our candidates to realize that it is a policy imperative to build on the Bloomberg/JSK agenda? Meanwhile in NYC, it’s easier to park a car illegally. I recently traveled to London. The “cycle hire” is fantastic. But riding a bike around London still requires a death wish. I was foolish enough to ride out to the Olympic village on Mile End Road “cycle superhighway”, which was nothing more than a painted bike stencil in the middle of the traffic lane on a speeding 4-lane arterial roadway! On the way there I saw no fewer than three ghost bikes, all within a terrifying multi-level roadway junction. When I finally got to the Olympic village I was surrounded by brand new parking garages and a suburban shopping mall…WTF? I thought the Olympics were supposed to be green. I really hope someone fixes the bike route between the central city and the village, before a bunch of spectators die on that road! Why does this happen ? British people point endlessly at New York and marvel at the progress that you make which they cannot, while American people point at London and say very much the same things in reverse. In reality, while any progress is good, neither American nor British cities yet provide much to inspire people from either country. You have to look to the Netherlands to see how to make cycling both incredibly popular and very safe. The Times’ demands are inadequate and badly researched. They have made it too easy for politicians to sign up and achieve good press for doing so, without having to commit to changes which would make any real change in the environment for cycling in London. 3) Has at least one opponent that is in favor of Complete Streets. This NCCS would place a very public bounty on that representative’s political head: A stated goal to raise $100,000 for the campaign of their opponent, and to place 1000 boots-on-the ground knocking on doors to education opposition for the incumbent in their district. People like me would gladly donate money to reach that funding goal. I’d also take time off work and travel – say within a 500 mile radius – to be one of those volunteers. So in the best case, maybe we’d be successful – maybe we’d unseat one anti-smart transportation congressman. And if we’re lucky, there’s be press. Maybe we can send a message… Play politics with out streets, and you might be next. Maybe it will make others think twice before they attack our sidewalks, trains and busses. Can anyone tell me if such a leadership organization exists?